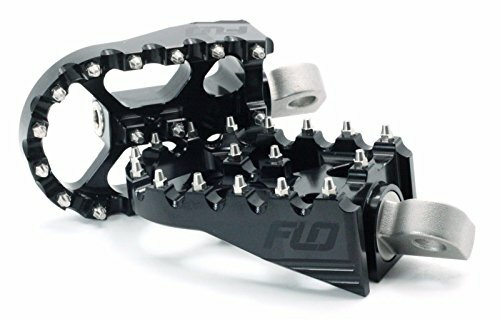 FLO MOTORSPORTS MOTO STYLE PEGS ~Machined from 7075 T6 Highly durable and light weight alloy. ~Wide Platform measures 2'' x 3.125'' ~Pegs can be rotated full 360 degrees to any angle and then locked down with stainless steel hardware (included) ~ Foot pegs have our exclusive pitch adjustment hardware that allows you to change the angle of the foot pegs to the riding position preferred by the rider. ~Replaceble stainless steel teeth (Cleats) NOTE: Will not fit 13-14 XL1200C/V/X models.